With a little imagination, the right tools and patience, masters dream up and create astonishing sand sculptures. For days, the team of sand sculptors worked diligently—packing, pounding, forming, carving and creating an unrivaled castle. Magnificent towers materialized first, each topped with a delicate finial. Next, sculptors balanced on midlevel platforms while chiseling out familiar landmarks such as the Leaning Tower of Pisa, the Statue of Liberty, the onion dome of the Taj Mahal and the upper lattice work of the Eiffel Tower. The lowest level showcased Rome’s Colosseum, Egyptian pyramids, a suspension bridge, a cruise ship, sleek skyscrapers and a jet emerging through clouds. 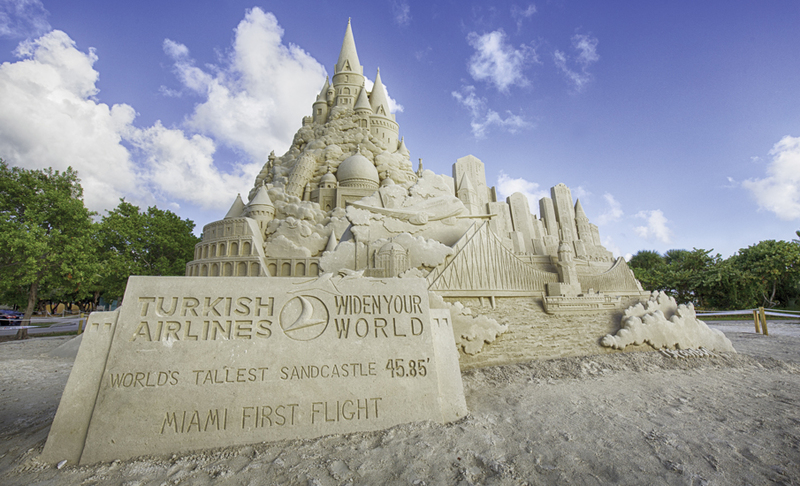 The team—led by Ted Siebert, owner and lead sculptor of The Sand Sculpture Co.—transformed gargantuan mounds of Miami sand into a 3-D masterpiece. At nearly 46 feet tall, the four-story sculpture successfully claimed a coveted Guinness World Record for the tallest sand castle. a 19-person team of both professional sand sculptors and experienced support persons, special tools, a bucket truck—not to mention patience and lots of man-hours. Plus, the team had to abide by certain building requirements in order to be a candidate for the Guinness record: The design had to be a free-standing structure with no internal supports that resembled a traditional sand castle. Siebert and his team of sculptors made the repairs and kept going. Then, on another morning, they noticed some unexplained damage to their work. Surprisingly, one of the wild cards sculptors encounter is the sand itself. “To build our record-breaking sculpture, we had to have nearly perfect sand,” Siebert explains. “Good sand holds together well. When I say bad sand, I mean sand that binds poorly or binds too [well].” His preferred material is river sand because it packs like brown sugar. Most ideas can be translated into a sand-friendly design. There are a few limitations, but knowing how to design around them is what separates the novice sand sculptors from the professionals. At The Sand Sculpture Co. overcoming such hurdles is an expected part of every project from beginning to end. From the preliminary plans, the team builds the necessary forms they will need to create the general shapes in the castle and packs sand into them. Once the forms are removed, the sculptors work their magic adding the details. It doesn’t bother Siebert to know that his masterpieces aren’t permanent. “We celebrate at the end, and then I start thinking about the next sculpture,” he says. Like many other pro sculptors, Siebert learned the nuts and bolts of sand sculpting by getting his hands dirty—or sandy, rather—participating in the many sand castle competitions around the country. Most of these have different entry categories to accommodate sand castle architects of all skill levels. One particularly welcoming competition, Sandsations, takes place in Long Beach, Wash. The big sculpting competition takes place on Saturday, this year on July 23. Contestants have a few hours to create their work of art within a designated area. Winners in the intermediate and masters categories stroll away with hundreds of dollars in cash prizes. With participants in the hundreds and spectators reaching about 6,000 last year, Sandsations is one of the largest sand-sculpting events in the country. Traditional sand castles, larger-than-life sea turtles, sandy cyclops, giant squids and other ephemeral works embellish the coastline by the end of the contest. For now, aspiring sand sculptors need only find a spot where sand and water converge to practice dreaming up and creating their own impressive creations. The U.S. is home to dozens of sand-sculpting competitions and exhibitions—beachfront and inland—each year. Discover a few of summer’s best sand-sculpting events that are sure to delight both competitors and spectators. More than 60 teams vie for the Golden Bucket Award at this fundraiser for the American Institute of Architects Houston, the Architecture Center Houston Foundation and the city of Galveston. In honor of the 30th anniversary, new categories have been added, including best incorporation of the number 30, tallest standing structure and most sustainable team. June 16-18; Hampton Beach, N.H.
Master sculptors compete with the hopes of winning more than $15,000 in prize money. Once finished, the creations are treated with a windproof adhesive so audiences can appreciate them for a few weeks after the big event. July 8-10; Port Huron, Mich. Proceeds from this ticketed festival support the restoration of the area’s historic buildings. The nominal fee grants access to demonstrations, master and advanced-amateur state championship competitions, hands-on lessons, an amateur contest and a Quick Sand Speed Sculpting Show. 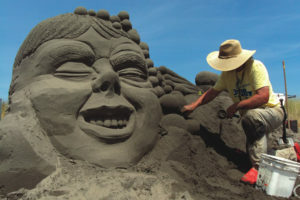 July 23; Long Beach, Wash.
Sandsations has been a favorite sculpting event for more than 30 years, where competitors building stunningly imaginative sculptures. Cash is awarded to the top master and intermediate competitors, while winners in the Family and Novice categories receive commemorative art pieces. July 16; Imperial Beach, Calif.
Sand-sculpting geniuses vie for honors just north of the pier. Meanwhile families can enjoy the parade, farmers market or Kids ’n Kastles event where five-member teams compete for Best Sculpture and Best Sea Creature awards. Eight-time record holder Ted Siebert has been packing and sculpting sand professionally for 25 years. Here, he offers a few of his sand-sculpting tips for beginners. “Damp sand sticks together, so you can shape and carve it,” Siebert says. Add plenty of water to sand in the forming stages, and mist the sand with water from a spray bottle while you are carving. 2. Collect many different forms. 3. Don’t forget to pack. “Pack the sand, then pack again,” Siebert advises. A dependable technique includes shoveling a little sand into a form, adding water, swirling the mixture, pounding the sand with your hands and repeating the process until the form is filled. Place the form upside down where it should be added, then tap it with a hammer or stick until it slides off. 4. Sculpt the finer details. Start sculpting little by little from the top and work downward so you don’t sprinkle sand on your finished work. Sculpting tools can be anything from palette knives, spatulas, melon ballers and ice cream scoops to chisels, trowels and screwdrivers. Finally, use brushes to texturize or smooth surfaces, then blow excess sand away with a straw.